Nose: Tropical fruits dominate, but there are other interesting elements as well. Clay. Chai tea. Key lime. Vanilla. Cinnamon sugar. Chocolate pie. Tart fruit candy (Sweet Tarts). Sunny Delight. Baked apples. Toasted coconut. Palate: The arrival is sweet with tropical fruits—papaya, banana, mango, passion fruit, coconut, etc. Orange is really quite prominent—orange marmalade, orange smoothie, orange chocolate. Fruit cobbler. Honey. Sour candy. Gummy bears. Oak. There is some bitterness on the backend, but it’s a somewhat pleasant type of bitterness—reminiscent of dark chocolate. Finish: More tropical fruits. Fruit jelly. Starts sweet, but turns dry fairly quickly. More of the same bitterness from the palate. Orange pith. Dark chocolate. Christmas spices. Baked cinnamon apples. 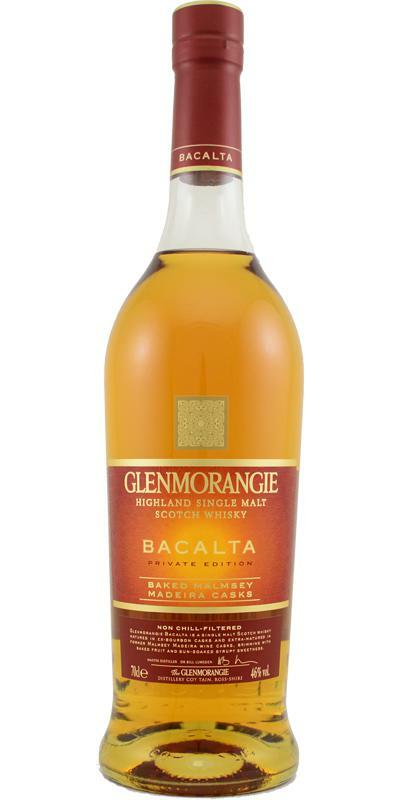 With all the tropical fruit flavors, I imagine this would be a lovely dram to enjoy while sitting on the beach. On the other hand, the orange and spice notes would also make this work well as a Christmas time whisky. Regardless, I’ve been enjoying this one quite a bit no matter the weather or circumstance. Recommended. Pretty delicious, 85 € are borderline for the taste, for a limited collection bottling but not really outrageous. a fruit concentrate, something like this with Glenmorangie. Not enormously complex but delicious and powerful. tremendous fruitiness, concentrated yellow fruit, pickled apricot, orange marmalade, buttery, creamy sweetness, honey. Delicious! here even more concentrated fruit flavors, closely interwoven. Orange juice with honey, slightly herb then, liqueur-like, and then light sherry-like raisin note. long, dry, the fruitiness will last a long time. This was a nice one. The interplay between the various influences was, as expected, very interesting and yet everything was also quite well balanced, and perhaps even too mild for the tastes of some. As for me I quite enjoyed it. Sometimes I find too much focus on the finish in these private editions, like last year’s Milsean, but for me this one was Baby Bear’s porridge. Quite a chewy malty note to it, more-so than the usual Glenmorangie profile. Creamy porridge with honey. Dried apricots. Vanilla and delicate floral notes galore. Light wood. Orange cake. After some time a light briney note shows up. Bitter wood. Lots of wood spice. Mint. Boiled sweets. Dried citrus peel. Herbal Honey. Slight nuttiness. Seville oranges. Medium-long. Very big wood spice note. Nutmeg, cloves and cinnamon. When that dies down there’s a bitter wood and vanilla not. A slight sweet, jammy stickiness behind it all. first Impression on the nose were oranges! fruity, sweet,flowers, wonderful. the first sip took a second until the flavours fully opened. there is first the sweetness, honey, fruits and this transforms into spices, malt. fine long finish, perfectly balanced! excellent upgrade of the 10 yo original. it´s very well balanced with the madeira influence. well done. baked fruits, caramelized orange peel, dates, roasted almonds. pleasant tingling on the tongue with a hint of malmsey madeira wine. the lovely tingling leads to white pepper aroma, citrus, marzipan, honey froasted pears. surprisingly madeira wine notes are present in the throat. [April, 2017] Another experiment from Glenmorangie and so far most of them were quite interesting and good (except the sulphur-spoiled Companta). After Milsean and the Malmsey Madeira I expected this to be very sweet but I don't find that it is. It is quite malty and rich and seems like an amped up Original 10 which is probably its base before the finishing. However, while I do like it, I find the alcohol in it quite harsh and this probably belies its youngish age. It is no surprise that my favourite Glenmorangie Private Editions were both age statemented - Ealanta 19YO and Artein 15YO. 87. Initially quite sharp with alcohol, surprising as it is only 46%ABV. Then custard creams, vanilla, light flower honey and very light oak. Sweet, warm fleshy fruits - nectarines or apricots? Strong whiff of menthol later in. Something a bit petroleum-y is hiding here too, a bit like Vaseline but elusive? With water, a little more oak and malt spiciness appears. I find this nose multi-layered but harsh due to the alcohol. Very nice mouthfeel with a viscous oily mouth-coating effect. Taste rich and sweet and both fruity and malty at the same time. I like it! Rich, earthy and spicy but surprisingly not heavy, I get white pepper and a hint of clove. Acetone. Honey and orange peel. Medium finish with a menthol tingliness and a malty earthiness.